The iPad was a real game changer for me in many ways. I embraced its minimalist approach. I appreciated walking into a meeting or a classroom with an iPad instead of a laptop (which was usually accompanied by a laptop bag with cables and other peripherals). Although I had been using ebooks in software like Accordance for years on my Mac, it was reading ebooks on the iPad that made me realize that maybe I don't have to hoard physical copies of books so much anymore. That led to similar ideas about other material possessions, but I'll write about that another time. It's true that I cannot do everything with an iPad; I still need my Mac. But if a situation will allow me to use an iPad instead of my my Mac, I choose the iPad. In teaching settings, I found that I could create my presentations on the iPad as well as carry electronic versions of textbooks and my course notes. However, I often had a problem. If my iPad was connected to a projector, I did not have easy access to other materials. A student might ask a question about something in a textbook, but I couldn't easily turn there if my iPad was in Keynote presentation mode. I realized I could just do the practical thing and start carrying a textbook and some basic notes again, but at this point, that seemed so backwards. I very briefly considered a second iPad. But that seemed extreme. Really, all I needed was something to carry a few documents around. As some of you may remember, I'd been contemplating a Kindle before the iPad was even released, but in the end I opted for the iPad because of so very many tasks this one device could do. And yet the reality remains that sometimes you just need two screens. Toward the end of last year, I'd received some Christmas money from generous relatives, so I ordered the $139 WiFi-only Kindle 3 . It's been a wonderful addition to my routine and method, and I now understand why Kindle users are so crazy about these devices. Granted, when sitting next to an iPad, the Kindle looks like a device that Apple would have created in the nineties. Nevertheless, it's the Kindle's E ink screen that is really the genius of the device in my opinion. Although I bought the Kindle as a secondary device to my iPad for notes and textbooks in the classroom, I quickly discovered that the Kindle is my preferred reading device—certainly preferred over the iPad, which frankly, can make my eyes sore after a while. When the months were cooler, the Kindle's size, with its six-inch screen, made it quite convenient to throw into a jacket pocket, something that I can't actually do with my iPad. In fact, I never could have imagined how much I'd enjoy reading with the Kindle. In fact, I believe that because of the Kindle, I'm actually reading more now. Since this post is about using the iPad and Kindle together, I don't want to spend too much time on the Kindle alone, but I will post a couple of related Kindle-only posts later this week. So how has the Kindle worked as a complement to my iPad? It's been extremely helpful with one significant exception, which I'll get to in a minute. For the most part, I've been able to do exactly what I wanted it for. It's great resource for when I have my iPad connected to a projector. Most of the time, I use the presenter notes built into Keynote for teaching, but if I need to refer to a specific book or article, I have them readily available on the Kindle. And now that the Kindle has page numbers, I can even tell my students, "Turn to p. 272 in your textbook," with confidence we'll (literally) be on the same page. There's only one problem, and it is a significant one. Amazon has great support for the Kindle if you want to convert a document such as a Word or PDF file to the Kindle format. You email it to them and then they send it to your Kindle converted—all for no charge. I've actually been quite impressed with the quality of the end product. However, often I need to have an article in PDF format remain as the original layout with the original page numbers. In other words, certain PDF documents are not as useful for me converted. The Kindle will allow for viewing of native PDF files, but the 6" screen on the Kindle 3 is simply too small. Yes, I can zoom in on them, but this is not a practical way to read a document. Of course, Amazon also sells the Kindle DX, which is a larger version of the Kindle, complete with a 9.7" screen—the same size as the screen on the iPad. PDFs are actually quite readable in their original format on the larger screen. The Kindle DX, which is often recommended for academic purposes because of its larger screen, unbelievably has never received the page number update from Amazon. In fact, the Kindle app on the iPad can display page numbers, but you can't see them on Amazon's own device, the Kindle DX. Why the incongruity? It's because the Kindle DX is a bit of a crossbreed device. It has the great E ink Pearl screen that the smaller Kindle 3 has, but the Kindle DX has the operating system of the older Kindle 2, which also never received the page number update and probably never will. So overall, the Kindle is a great tool, but there needs to be a Kindle with a larger screen like the DX, but with all the features of the Kindle 3. When Amazon offers this, they will have a much better offering for academic use. Right now, folks who are interested in a Kindle for academic use—whether as a standalone device or as a companion to the iPad or other tablet—will have to decide whether the Kindle 3 (with better features and page numbers) or the Kindle DX (with a larger screen, but an older OS) is best for their uses. Stay tuned. 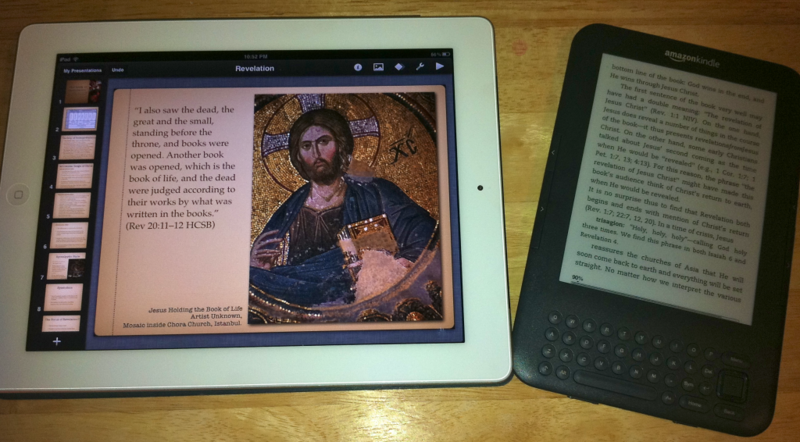 I've got more to offer this week about the Kindle and how I'm using it—even beyond the classroom. Some may see it as predictable, but honestly, as early as Friday morning last week, the day of the iPad 2's release, I was denying that I was upgrading from the first gen iPad. And I meant it. But then my circumstances changed about mid-day, and thanks to a very generous gift, I was able to procure the iPad 2 from the Apple Store in Louisville, Kentucky. This is not a review of the iPad 2. Those are a dime a dozen at this point. Rather, here are a number of mostly disconnected observations based on my experience over the last four or so days. Black's Always Cool, But White's the New Black. I don't know if I was fully decided about which color to get—black or white—until I got in the store, but I was leaning toward white. As I assume most of you know, the original iPad came with only a black bezel around the screen. Now consumers get a choice, albeit limited to only one more choice. In the end, I chose white. It wasn't a nailbiter choice, mind you. I just thought I'd like to have a slightly different experience. It's interesting that since last Friday afternoon, if you walk into just about any Apple Store, you will primarily see white iPads everywhere. Even the employees are carrying the white models. I had initially one concern about getting a white iPad: it might show dirt more easily. I wasn't alone in this fear since a friend of mine voiced the same thing, and I heard people interviewed on various tech podcasts say this, too. My hunch is that this concern is especially relevant if you ever owned a white plastic iBook or MacBook. After a few weeks, the white plastic, especially on the palm rest, frankly looked gross. You could clean it, but good luck getting it back to the original pristine white. The iPad's different though because regardless of whether you get white or back, the plastic is under glass. It's not going to absorb the grime from your hands regardless of how much you refuse to wash them. And an added benefit? Fingerprints show up less against the white than on the black. If You Use It to Teach, the iPad 2 Is a Significant Upgrade. 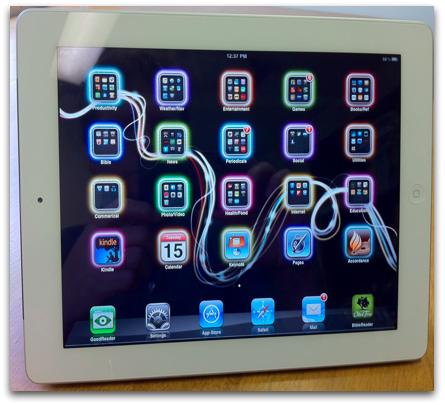 The phrase being thrown around in a lot of reviews is that the iPad 2 is an "evolutionary and not revolutionary upgrade." And this is true (and probably by design). However, there was one major new feature that will benefit anyone who teaches with an iPad: the ability to fully mirror the screen. With the original iPad, video out was implemented on an app-by-app basis. So presentation programs like Keynote for the iPad could send slide images to a projector if connected with the iPad VGA adapter, but most programs could not. The ability to throw anything on the screen is pretty exciting. This means that if I'm teaching a New Testament class in Keynote, and I want to switch over to a Bible software application such as BibleReader or Accordance, I can switch to these and perform live instruction from these apps. Every teacher with an iPad and a related educational app has no doubt been frustrated about not having the ability to mirror every screen. Now all that has changed. In fact, this past weekend at church, when I switched between programs, one fellow who's seen me use Keynote on the iPad dozens of times, asked "What's that?" when he saw my desktop of icon folders. Of course, the first gen iPad has always had this ability as evidenced by Apple's own internal use of this feature during presentations as well as a fairly popular app for this that works with jailbroken iPads. Sadly, Apple has not allowed first generation iPads to have this feature even though they are certainly capable of it. Contrary to What You May Have Heard, Mirroring Works with the VGA Adapter. Part of the announcement of iOS mirroring, mentioned above, included a new adapter for connecting the iPad via HDMI to an HD television or an HD projector. This led to a question as to whether video mirroring worked with the original VGA connector released with the first gen iPad. In fact, I waited in line with a buddy of mine who was buying his first iPad. The Apple Store sales rep actually told him that mirroring would only work with the HDMI connector. I told her that this did not square with what Apple's own website states: "Video mirroring and video out support: Up to 1080p with Apple Digital AV Adapter or Apple VGA Adapter (cables sold separately)" (emphasis added; see the iPad Tech Specs page under "TV and Video"). I had already confirmed that the first gen iPad would not mirror with the 4.3 update, but one of the first things I wanted to test was the ability to mirror an iPad 2 with merely the VGA adapter. Using the VGA adapter, I have successfully mirrored the iPad 2 with both my television and an Epson projector. It works great. My main use of the iPad for this is with data projectors, but none that I have access to at the moment use HDMI. So, the VGA adapter works great. Contrary to What You May Have Heard, the Keyboard Dock Works with the iPad 2. Recently, I read somewhere that only about a quarter or less of iPad owners use an external keyboard. That's probably a testament to how well the on-screen keyboard works, but I occasionally find myself in situations in which I want to use a regular keyboard with my iPad. I bought Apple's keyboard dock at the same time I bought my original iPad last year. I liked that it provided a very stable stand for the iPad while typing and that it also had an iPad specific row of function keys. However, I didn't like that it's odd shape made it difficult to fit in a bag or that the iPad could only be used with it in portrait mode. I do a LOT of Keynote work on the iPad, and Keynote will only run in landscape mode. That means using the keyboard dock with the iPad can give you a sore neck really fast. For what it's worth, I have tried the iPad with one of Apple's Bluetooth keyboard and that is probably what I'd recommend that most folks use who want a physical keyboard with their iPad, even though there aren't iPad specific function keys. Incidentally, if you use one of Apple's new "Smart Covers," the iPad is quite stable in upright mode to use with a Bluetooth keyboard. FYI: stability is an issue in these contexts, because even when using an external keyboard, you still have to use the touch interface of the iPad's screen. You want it to be stable so that it doesn't fall over every time you touch it. Regardless, the new iPad 2 rests in the original keyboard dock just fine despite its slightly different dimensions. In fact, I used the two together for a faculty observation I was performing last night, and I noticed no difference from the performance with the original iPad. Having said that, though, I still may eventually go with a Bluetooth keyboard myself. It would certainly be easier to carry the two together. Apple likes to refer to the iPad as "magical." While that may be a bit of silly hyperbole, the new Smart Covers are the closest thing I've seen yet to anything that might be called magic. It was really somewhat amazing when I first attempted to place the cover on the iPad 2. There seemed to be a bit of AI in play as the cover didn't even wait for me to line it up, but immediately grabbed onto the iPad and was lined up perfectly. The ease of placing the cover on the iPad 2 is quite a contrast from putting Amazon's Kindle cover on their eReader. The first time I tried that, I nearly broke one of the hooks, not understanding how it was supposed to be attached. This automatic "physical syncing" between the Smart Cover and the iPad 2 is achieved through magnets--31 total between the cover and the iPad 2 according to folks who have taken both apart. Somehow this feels dangerous. I remember when we were told to keep magnets away from our computers! As amazing as these covers are, somehow my new iPad seems a bit naked. The screen is protected, which is a good thing, but the aluminum backside is bound to get scuffed and scratched after a while. There are numerous companies that provide protective films for screens, and now we might need something similar for the back of the iPad. Or at the very least, all those companies that make iPad cases can breath a sigh of relief because I imagine some iPad owners will opt for a bit more protection. I actually liked Apple's original folio case with one exception. With the case on, it wouldn't fit in the keyboard dock (which, again, evidently only I liked). So, as some of you remember, I "modified" mine with scissors, but Kathy said it looked unprofessional because I can't cut straight. I also liked how the iPad looked and felt in the folio case when I could carry it into a meeting as if it were a very thin Daytimer. Besides the gee whiz aspect to the Smart Covers, I have to wonder why Apple went this route. I can only imagine it might be because they got tired of seeing the iPad covered up (or more likely, their logo covered up) whenever an iPad was used in real world situations or on television. With the increasing number of new tablets appearing on the market this year, and inevitably appearing in media and in the workplace, Apple probably wants to make certain that their iPad is distinguishable from the rest of all the forthcoming tablet noise. I wonder if whether longterm, I'll want to put the iPad 2 in a more traditional case. The way it folds to prop itself up, either vertically or at an angle for typing, works great. But Sunday, when I was trying for the first time to use my new iPad with Keynote, connected to a projector, the iPad wouldn't stay at the top of the podium I was using. This was never a problem with the original, black folio case. I could turn the cover back, slip it into its notch to put it at an angle, and it would hold its place, even on a slanted podium. With nothing on the back of the iPad 2, there's nothing to grip the underlying surface. I wanted it to stay at the top of the podium, but it insisted on sliding to the bottom. With the Smart Cover folded into a triangle, I've found that I also could hold the iPad in one hand, in portrait mode, providing I kept my thumb over the bezel. These magnets are strong, but the cover can still come off quite easily and the entire iPad should never be left hanging from the cover. In fact, I've already dropped mine this way, but fortunately, it landed on my living room couch. But how many of us dropped our first gen iPads and were thankful we had them in a full case? I predict with Smart Covers alone, we're going to see a lot more broken iPads this year. I wouldn't recommend anyone use an iPad regularly without some kind of protection for it. I believe there are going to be better ways to protect the iPad 2 (none of the first gen covers fit the iPad 2, incidentally) than the Smart Covers, but at the very least you need to have something on your iPad. Professionalism Comes with a Price. It's nice to see Apple bringing some visual variety back to its products. In some ways, I miss the colorful days of the fruit-flavored iMacs and original iBooks. Most Apple products in recent years have been black, silver, and sometimes white. Last year's iPad folio cover from Apple only came in black, although third parties supplied a wide variety of colors and designs. Nevertheless, Apple's return to colors, even in this small way, is a welcome change. The new covers come in either polyurethane or leather. The difference in price is significant—$39 for plastic and $69 for animal hide. I would have been fine with a polyurethane cover, having given up on any need for "real" leather a long time ago, if it were not for one thing. What was not immediately clear to me (and probably a lot of others) is that only the neon/pastel colors are polyurethane, while the darker colors—what I consider to be a better fit for most "professional" contexts—come only in the leather. I would have been more than willing—no, preferred—to buy a lower priced polyurethane cover, but I didn't want ANY of the polyurethane colors. In the end, I opted for the dark blue leather. As already described, there are pros and cons to these covers, but they are pretty amazing for what they are. However, when you hold it by itself in your hand and realize that you just paid $70 for it, well...that's a bit hard to take. When Steve Jobs introduced the iPad 2, he said it was up to twice as fast as the first iPad. It has a faster dual core processor as well as twice as much RAM (although Apple never wants to talk about the RAM in its iOS devices). As everyone has said, the first gen iPad was no slouch, so how distinguishable is the second one? Well, I have no idea; the first iPad was fast enough and in most apps, the difference is imperceptible. However, I do see a real difference in a couple of apps. First, I see a difference in some Keynote transitions. I'm not one to use too many distracting transitions between slides anyway. A plain dissolve is usually fine with me. However, I do like the "Anagram" transition in Keynote which, when advancing from one slide to another, will use a few letters on the first slide to create the word on the second slide (here's a brief YouTube video of it in action). I like Anagram because it's subtle, but also because I feel it can visually link the concepts in one slide to the next. On the original iPad, sometimes the Anagram transition would stall a bit. I'd be ready to go to the next slide, but I could tell that Keynote was processing a number of algorithms to get the transition to work. Often I would go through a presentation ahead of time, and if an Anagram transition took too long, I'd simply use a simple dissolve. Sunday, I noticed that none of my transitions were slowed down. The Anagram transition worked without a hitch, no doubt benefitted by the extra RAM and faster processor. Second, I keep quite a few PDF files on my iPad in GoodReader. Some of them are quite large, hundreds of pages long. I use GoodReader, not because I liked its interface best (I really don't), but rather because it's been more robust than a lot of the other readers, crashing less often than other apps when viewing extremely large documents. But as good as GoodReader is, I could still crash it on the the larger files, especially if I moved through pages too quickly. With the new iPad, while I don't imagine that the extra memory and faster processor make a program like GoodReader completely crash proof, I have noticed that larger files are much more stable, and I'm seeing fewer crashes. The biggest criticism the iPad 2 has received relates to the lesser quality of the iPad 2's cameras, although from what I understand, the front facing camera is the same quality as the front facing camera in the iPhone 4. It's the rear camera that receives the bulk of criticism as really lacking in quality. Believe it or not, that rear camera is LESS than one megapixel! Now every once in a while, for sake of full disclosure, I do remind readers that I own a small amount of Apple stock. However, I have no desire to defend Apple on the quality of the camera, as I would like to have better ones, too. However, I do try to understand Apple's reasoning in issues like this—beyond the mere suggestion most often offered that crummy cameras were offered now, so the better cameras can be a feature of the iPad 3. I'm certain each iteration of the iPad will continue to get better cameras, but why not offer something better right at the beginning? I can't fully answer that question, but here's my theory. I think that for right now, although the lack of a camera on the first gen iPad was lamented even before it was released, Apple's main goal for cameras on the iPad 2 is to help further solidify FaceTime. Whether this will be successful in the long run, I have no idea. I have FaceTime on my iPhone 4, my Mac and now my iPad, but I think I've only used it a couple of times. I have no doubt that there is a Windows version of FaceTime in the works, too. I really believe Apple is trying to make Facetime as much of a standard as Skype. And for FaceTime, these cameras are perfectly fine. Of course, I have no doubt that many will use the iPad for photos and recording video, and while I don't believe it's going to be the best tool for that job, Ken Rockwell is surely correct when he says that the best camera is the one you have with you. Fortunately, I usually have my iPhone 4 with me, which is an undecidedly better camera, although not as nice as my Canon Digital Rebel (which I don't often have with me). If Apple didn't intend for people to shoot video, why would they release iMovie for the iPad? Well, if they didn't, someone else would release a similar product. More on iMovie on the iPad in a bit. Another criticism of the iPad 2 is that there is no drop in price from last year's iPad. We're accustomed to seeing technology gradually come down over time. And it's no secret that the cost for production of a product goes down after a time, although I guess the iPad 2 would at least partly count as a different production run. Again, I'm not wanting to defend Apple here so much as simply understand their motives, and in this case, I think I do. Again, I'm no different than any other customer in that I'd like to pay less for an iPad, too. However, from Apple's perspective, keeping prices the same for right now is good business sense. Why should Apple drop its prices? You drop your prices in order to be competitive. And here's the key: at this moment, Apple has no competition in this market. I have no doubt that eventually, the tablet field is going to get very crowded. When there's some real competition for the iPad, Apple will decide to drop the price of its device. This will competitively undercut the competition who will still be under the obligation of a higher cost of production to keep their products at a higher cost just to recoup their investment. This is Economics 101, really. I have no idea if it's true, but I remember when the iPad was first released, reading that some Apple insiders were surprised when the bottom tier iPad was announced at $499 instead of $399. In the big picture, $499 surprised everyone a little bit because Apple rarely sells anything for under $500. A lot of early predicters were expecting the iPad to be higher. But knowing that it costs less than $300 to make, evidently many inside Apple were supposedly told that the iPad would start at $399. And then, according to the rumor, Steve Jobs/Apple changed his/its mind. And again, why not? Economics 101 again: prices are set by what the market will bear. If customers hadn't gone gangbusters over the iPad, I have no doubt it would have been dropped down to $399 for the starting level within six months. But people kept buying it at the prices set and no competition emerged during 2010, so prices remain the same today. Competition from other companies will be good for consumers because it will bring iPad prices down as well as prices for competing tablets. Further, competition will result in a better iPad 3, 4, 5, etc. and that will cause better results from the competition as well. iMovie: My upgrade to iMovie on the iPad was free because I had bought the earlier version released for the iPhone. I tried using it one time on the iPhone a while back and gave up. The iPhone's screen is simply too small for editing video. It was difficult simply based on the impracticality of it. However, iMovie on the iPad is quite handy and pretty easy to use. I doubt I'd ever do much video recording with the iPad, but I did transfer over about four minutes of video I'd recorded on my iPhone. Editing on the iPad was easy and even enjoyable. The themes save a lot of time. There are a number of ways to share the final product, but oddly the MobileMe gallery is missing. GarageBand: Okay, if you've never been into GarageBand on your Mac, don't let that stop you from taking a look at the iPad version. It's the touchscreen that makes the difference because you can actually play instruments. Even I, with zero musical ability, can fake my way through it with the so-called "Smart Instruments." In fact, I found that doing some basic strumming on the guitar to be quite relaxing, even though I'd have no desire to do so on a real guitar. GarageBand works on all iPads, even last year's, so for $5 give it a try. See a demo video here. Elbow Room: I realize that my use of an iPad is probably not typical, but with the original iPad, I had run out of room in recent months with the 32 GB version I'd bought last year. I regularly had to move files on and off the iPad based on what I needed for the week, often having to put them back on if I need them again the next week. So, this time, I got the full 64 GB iPad. I'm very pleased. In fact, it was a bit thrilling to be able to download my entire Accordance library over the weekend to my new iPad. I've been using Accordance on the Mac since 1998 and over the years, I've built up quite a digital library. Before, I had to be very selective as to what titles I carried on the iPad. With this larger iPad, I can load everything and not worry about it. So, those are a few observations. I agree with most who say that if you already have an iPad, the iPad 2 is not a "must have" upgrade. In fact, my wife, Kathy, says that while she wouldn't mind having a new one, doesn't feel any rush to get one. Nevertheless, I feel very fortunate to have mine, especially in light of the ability to mirror screen and the upgrade to the 64 GB model. Feel free to ask question or add your own in the comments. I've said before that I'm excited about tablet computers in general and the potential they bring. Some are going to prefer the Xoom, or the Playbook, or the Galaxy Tab, and that's fine. These devices, while not currently replacing everything a computer can do, certainly give us greater freedom and mobility when we can use them instead of a computer. Yes, there will always be the next big version of each of them coming down the pike, but if you don't have one yet, I encourage you not to wait, but instead, jump in and enjoy the party. I know that while my posts have been infrequent lately, the most recent entries have primarily related to Accordance in one way or another. I promise that I will add a bit more diversity back to This Lamp very soon. I have a long lists of topics to write about, including a number of long-promised reviews. As I write this, I'm sitting in a service center getting an oil change and the tires rotated on my wife's PT Cruiser. We put about 2200 miles on it last week driving from Simpsonville, Kentucky, to Mesquite, Texas, with a couple of brief stops in Louisiana to visit family—and then back! The main purpose of this trip was for me to attend the first-ever Accordance Users Conference, which met from September 24-25. The Accordance Users Conference was designed to be distinct from the normal training seminar (of which I've led three or four myself in the past). While attendees could certainly learn to use Accordance better as in a training seminar, the Users Conference was chance to see a variety of specialized presentations on numerous topics. The timing of the conference also coincided with the release of Accordance version 9, and the upcoming iOS version of Accordance which was publicly demonstrated for the first time. Two scheduled speakers were unable to attend. Martin Abegg had a family emergency, and Joe Weaks was ill. Abegg had been scheduled to deliver an address on the Dead Sea Scrolls. Roy Brown, the creator of Accordance and president of Oak Tree Software, filled in for him adapting a presentation he had previously presented on the subject in Israel. Is Accordance for Academics Only? Most of the time, attendees had a choice between "heavy" and "light" sessions—or technical and non-technical or requiring biblical languages and not requiring biblical languages. I tended to gravitate to the so-called "heavy" sessions, but I have to admit that this was partly because I was also in the back grading papers and there was more room for this in the larger room. One supposedly "lighter" session I did attend was David Lang's "Sermon Prep Workshop." It was not that I thought Greg Ward couldn't teach me anything new in his concurrent "Original Languages Workshop," but I was more intrigued to see what David would present. Here's why: often I hear a bit of faulty wisdom out there saying that Accordance is better for academics while Logos is better for pastors. The truth is neither of these assertions is valid. 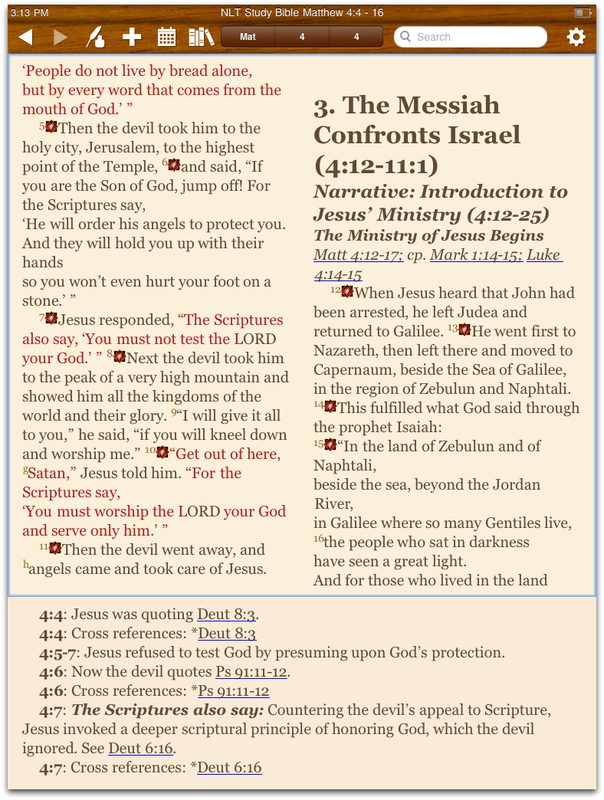 Logos can be used for academic biblical study and pastors can use Accordance for sermon prep. And people do both with each platform every day. David, admitting he doesn't preach sermons every week, chose to create a conversation with people in the session—most of whom were pastors—regarding how they use Accordance in their preparation. Lots of good ideas were shared. This led me to an idea for a similar session that perhaps the organizers could implement for next year's conference. I know from the Accordance training sessions I've led as well as from the Accordance forums that many pastors use Accordance intensively in their sermon preparation. I believe it would be a great idea to bring in a pastor for next year's conference who is both an experienced Accordance user as well as a seasoned preacher to demonstrate his actual sermon preparation workflow to attendees interested in the subject. Something like "Using Accordance for Sermon Preparation: 7 Basic Steps" or something similar might be helpful for those who preach regularly. On the evening of the first day of the conference, Daniel Wallace gave us a presentation relating to his work with The Center for the Study of New Testament Manuscripts. Wallace and his team have been traveling the globe making high resolution photos of priceless, ancient manuscripts before they are lost to history due to age and deterioration. Using high res photography and, in some cases, ultraviolet imagery, the team has been able to create better images and see text more clearly than ever before. The detail in the images Wallace showed us was truly remarkable. And the high res photographs are going to be invaluable for text criticism over the old microfilms that were the only resources some scholars have had to work with. Moreover, in the process of photographing known manuscripts, the CSNTM team has discovered over 70 previously uncatalogued New Testament manuscripts in the last 8 years. As an aside, this work is fairly expensive. The cost to preserve one page of a unique, handwritten page of the New Testament is $4. The average cost of one NT manuscript is $2200. The CSNTM is a worthy cause for your donations regardless of your theological leanings or background. In conjunction with Dr. Wallace's presentation, Roy Brown announced that there is currently in the works a project to bring many of the high resolution images taken by CSNTM to Accordance, much as has already been done with the Dead Sea Scrolls Images module. I got a sneak peak at the Sinaiticus images that will be made available. Between that and other tools already available such as the digitized Codex Sinaiticus modulealready available, Accordance users are increasingly able to do their very own textual criticism beyond the resources text critics had available a century ago. At the beginning of the second day of the conference, David Lang presented attendees with "A Brief History of Accordance." This was a fascinating session for anyone such as myself who enjoys history of technology, but it was also interesting to hear the history of Accordance development from much of the early "wild west days" which led up to the sophisticated features we have in v. 9 today. I've been using Accordance since version 3.5 (I think) in 1998, but I didn't know all of the background stories. David is a master presenter who knows Accordance and its history, perhaps only second to Roy Brown himself, but sadly, the brief history was simply too brief. Thirty minutes turned out to be too short of time for this subject, especially with audience comments and question. For next year, I recommend giving this subject a full hour, perhaps titled "A Not So Brief History of Accordance"—and with more screenshots from the early versions, too! 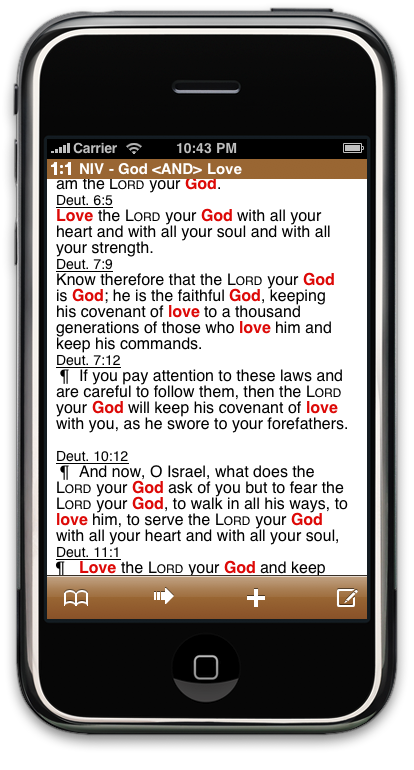 Much of Saturday's emphasis centered on Bible software in the mobile space. Scott Knapp, Oak Tree's primary iOS developer, gave the first ever public demo of Accordance for iOS. Participants were given a look at an early beta and feedback was invited. When the final product is released this Fall, it will be a universal app (meaning it will be optimized for both the iPhone/iPod Touch and the iPad). Accordance was not the only Bible software with a presence at the conference. 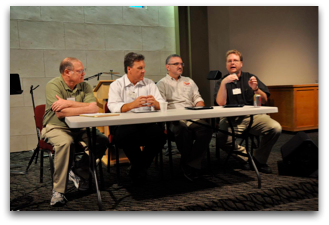 Drew Haninger, CEO of OliveTree Bible Software, joined us for a panel discussion I chaired on "The Impact and Future of Mobile Bible Software." This was a "big picture" discussion on the history and current state of mobile Bible software as well as projections for what the future might hold. Although our discussion focused primarily on Apple's iOS, we also referred to Android and Kindle, among others, a number of times, too. 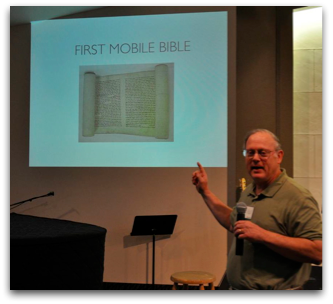 Olive Tree's Drew Haninger shows us the "first" mobile Bible. The panel discussion on mobile Bible technology was very enjoyable to participate in. Certainly, this is where the focus of my technology interests currently lie. In fact, I originally considered showing up at the conference with only my iPad in hand, but the fact that I needed to grade papers (which I cannot currently do on the iPad) and with the release of Accordance v. 9, I lugged my MacBook Pro along, too. Nevertheless, I suggested to Drew that we ought to consider a mobile Bible technology podcast because there is certainly lots still to discuss. Also, for those of you who know what I'm talking about, Drew showed me a very quick look at "Project Glacier." I'd like to tell you more, but I'd have to kill you afterwards. But just be patient—it looks awesome. 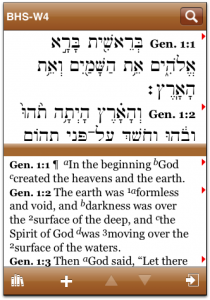 Admittedly, Accordance was not the first Bible software program to the table with syntax tagging, as many will acknowledge the extremely interpretive nature of assigning syntax to words and phrases in a biblical text. 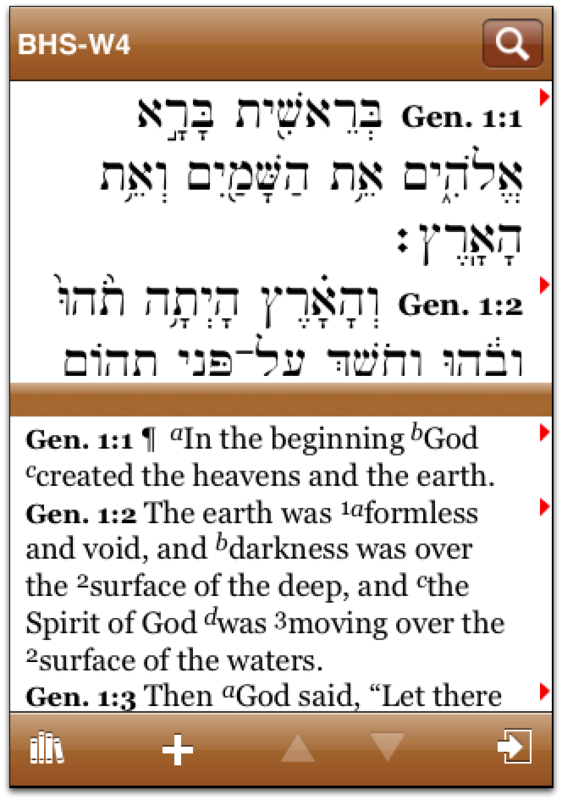 Nevertheless, since users kept asking for it, Oak Tree recently made available the beginnings of its syntax modules for both the Greek New Testament and Hebrew Bible with the promise (specifically made at the conference) of more to come. To see screenshots of Accordance syntax in action, see my previous post. Robert Holmstedt delivered a paper, "Understanding and Using the New Syntax Searching Capabilities in Accordance 9" which offered a detailed look at both the philosophy behind Accordance's approach to syntax as well as practical and even very specific searches that can be performed. A copy of the paper can be downloaded from Holmstedt's public dropbox folder (if that link becomes broken in the future, let me know). Besides the mobile technology panel, I also participated in the final session, "Ask the Accordance Experts," which was supposed to help round out any remaining "how to" questions regarding Accordance. I was very flattered to be the only non-company (although I have done contract work for Oak Tree in the past) member of the panel. Unfortunately, almost immediately the discussion became a forum for some attendees to voice suggestions (or complaints) about various elements in the user interface. While the Oak Tree employees surely appreciated the suggestions, this was not the actual intended focus of the session, and as one idea spurred another, we never fully got back on track. Thus, I had little to offer in this session. Perhaps next year, a separate session could be offered—perhaps on day one—for suggestions and feature requests. These are certainly important, but I imagine a number of users could have better benefitted from the final session if it had proceeded as originally intended. The Accordance Users Conference seemed from my perspective—as someone who is both a user and a "sometimes" insider—to be a great success. The sessions were diverse and targeted every skill level. An untold number of fascinating conversations took place both during and in between sessions. It was great to meet many folks in person whom I'd only corresponded with online before. I hope that this becomes an annual, or at least a regular event. When the next one is announced, I strongly encourage you to make plans to be there. It was truly an experience that cannot be simulated by the internet or even at one of the Accordance training conferences (as these are different in purpose) held throughout the year. One more thing: A number of people have asked me if the sessions were recorded. I don't know the answer to that, but if I find out, I'll post information here. Progress on the Accordance app for the iPhone/iPad is dramatic. We expect to release it this Fall. It will run your Accordance modules, and offer most Accordance search functions. Convenience, speed, and privacy are maximized; there is no need to be on-line to use it. Once you download your modules to your mobile device you can search and read your modules and edit your notes off-line. In the future we plan to add even more features. I watched a friend preach a sermon the other day, and while his sermon was quite good, and while he quoted Scripture throughout the message, he never actually preached from a physical Bible. Instead, he read Scripture as it was projected onto a large screen. Now, I have no problem with projecting Scripture onto a screen; in fact, I believe this not only helps those who don't have a Bible with them (although it may encourage that, too), but when words are held in front of us in large letters, I believe it can even help us reflect on what the text is actually saying. However, I saw two immediate downsides with this mode of delivery. First, he was dependent upon a person in the back of the auditorium running the slides to advance each part of the passage from which he was reading. Because the person advancing the slides did not do so in anticipation of the next part of the text, there was a pause at the end of each slide full of text, regardless of whether the break was a natural break or not. This drastically reduced my friend's ability to read the biblical passage with any kind of natural sounding expression, and ultimately the reading of God's Word became a necessary "task" rather than a meaningful part of the sermon. This is not too different in the end result from sermons I've heard in my lifetime in which a biblical passage was rushed through, read with little meaning or expression, so the preacher could get on to the "meat of the sermon." Secondly, I really believe that there's something psychologically (meant in the most positive sense) beneficial for people to see a preacher or teacher actually reading from a physical Bible. Maybe it's the fact that I've been a lifelong Baptist, and most of us have a high view of Scripture anyway, but to me there's a certain perceived authority that comes from having that Bible in hand. I realize God's Word is God's Word and still just as authoritative whether it's on the lips of someone speaking it, on a scroll, on a Bible's printed page, on a computer screen, iPad, projector, or tattooed on a right ankle. But I also know there's perceptual difference if you and I are about to have a heart-to-heart talk, and I place a physical Bible between us as opposed to my iPhone with BibleReader pulled up (and that's not a knock against BibleReader). Now, if you know me at all, you understand that I'm often the first to embrace technology of many different kinds. Sometimes, I'm probably guilty of embracing technology simply because it's "new and shiny." So, I'm not coming from the perspective of a Luddite here. Further, most of my time spent in Bible study—whether for personal or professional reasons—is in front of Accordance on my MacBook Pro. And since the iPad was released, BibleReader has been my main Bible on-the-go for settings such as the Wednesday morning Bible study I'm a part of. But in those instances, I'm not in front of a group. That's the difference. And if in front of a group, whether in the church or in the classroom, you will still see me use a physical Bible. 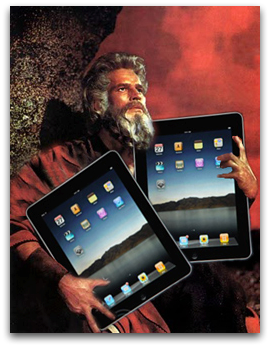 In the Bible study I teach on Sunday mornings at church, I do use my iPad—but not as a source for biblical readings. I've been carrying my iPad for running my Keynote slides. It's much more convenient than carrying my entire laptop. So I run the slides from the iPad, but I teach from my Bible and a page of notes (once Keynote for the iPad gives us presenter notes, I'll stop bringing the page of notes). As the class and I walk through a passage together, I don't "hog" the reading of Scripture. I invite others to volunteer to read. But I often make a statement something like this: "Now, if I could have a volunteer to read _______ with a loud and clear voice, with great expression and annunciation." That usually draws a bit of a laugh, especially from newcomers, but I really do mean it. Public reading of the Bible seems to be quickly becoming a fading skill. My first preaching experiences came when I was in college in the late eighties on our mission trips and at the little country churches fairly close driving distance. My Louisiana Tech BSU director, Lynn Hawkins, spent time with me to show me how to read the Bible in front of an audience. He taught me how to hold it up in front of me, but not covering my face. He demonstrated how it should be held in one hand while the other hand traces the words I'm reading, allowing for periodic eye contact with the congregation without losing my place. He told me not to rush through the reading, but to read the Bible with clarity and expression—as if it were the best thing I'd ever read. He told me that it was okay to read a verse or two from my notes, but when reading more than a couple of verses, and especially when reading a main passage, it should always be done from the Bible. For better or worse, and regardless of the already mentioned fact that Scripture is Scripture is Scripture, people want to see a Bible in your hand if you are engaged in public proclamation of God's Word. I really believe that. And I believe it crosses multiple generations. I certainly can't be accused of not embracing new formats. Since I first got my iPad, I'm now convinced that electronic books are (for the most part) much more practical than their physical counterparts. In fact, I don't care if I never buy a physical book again. When looking at a new title, I immediately look to see if it's available as an eBook. But if you hear that I'm going to be teaching or preaching somewhere, don't let it surprise you when you see me holding a very non-tech, analog, turn it page-by-page...Bible. Friday, I am presenting a session at IWU's "No Educator Left Behind" Conference regarding classroom instructional use with the iPad. I'm going to start with a Keynote presentation on the iPad, but eventually move to simple demonstration using a document camera. I wanted to insert a video clip early on in the Keynote presentation demonstrating the iPad's ability to show video as part of a presentation. 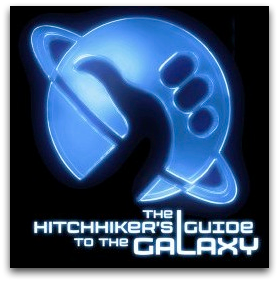 My first idea was to include a clip from the movie version of Hitchhiker's Guide to the Galaxy—the part where the Hitchhiker's Guide is actually introduced—because the iPad is kind of like the Hitchhiker's Guide in some ways. But upon watching that clip again, I think it's a bit too sacrilegious in content for the context and might even take away from my presentation. Therefore, what would you think of as an appropriate, brief (1 to 2 min. max) clip related to the iPad? And I don't mean simply an iPad commercial. Let's assume everyone's seen those. I'm looking for something parallel in concept to the iPad from a movie or television show. If you've got any good ideas, please leave them in the comments below. Proposal Accepted: "The Empty Book Bag: Digital Instruction Using the iPad & Related Technologies"
2010 may be the year that we begin the transition to digital content as a mainstream practice. This session demonstrates how the IWU facilitator can "leave the book bag at home" and use one tablet device for course guides, lesson plans, textbooks and even presentations on a projector. Is a textbook not available in digital form? This session will show you how to convert a book from its physical format to digital for use on any platform. 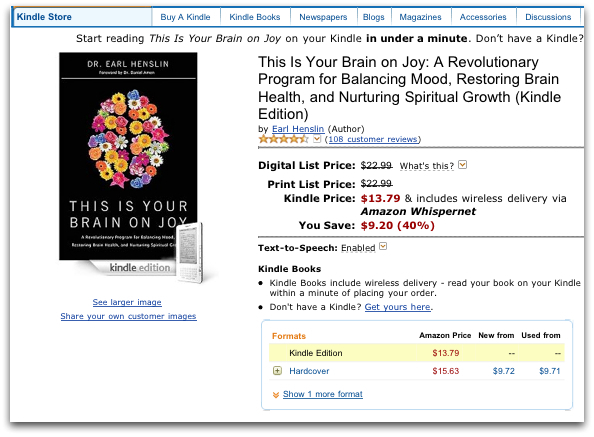 Yesterday, I was looking for the book This Is Your Brain on Joy by Dr. Earl Henslin. Now that I have my iPad, and it has proved to be an effective means for book reading, I really don't have much desire to buy a physical book if I can avoid it. As you probably know, there are two primary eBook apps on the iPad so far: Amazon's Kindle iPad app and Apple's iBooks app. Currently, there are more books available for the Kindle app by a wide margin. There's not a lot of functional difference between these two apps when it comes to book reading in my own experience. The Kindle app has the ability to include one's own notes which I hope that Apple will add to the iBooks app. Apple's iBooks app has a built in dictionary which is very handy when coming across a word for which I'm uncertain of the meaning. If memory serves, a dictionary is included in the physical Kindle, so maybe this will be added later. Both apps allow for highlighting and bookmarks. Also, both apps have access to their respective stores, but Apple's iBooks Store is internal to the app while the Kindle app shells out to the Amazon site via Safari. The most glaring difference between the two readers relates to searching. I can search for any word or phrase in Apple's iBooks, but not in Amazon's Kindle app for the iPad. The ability to search for words in an electronic text is one feature that makes the digital superior to the physical. Even when books have indexes, the reader is left to the mercy of what the indexer thought was important. I'm hopeful that Amazon will plug this glaring hole in the Kindle app. Anyway, when I looked up the book in each respective store, I was very pleased to see that it was available in both apps. What surprised me was the difference in price. Generally most eBooks are different in price from their physical counterparts, but I was surprised to see such a difference between the two eBook stores. The Amazon Kindle price for Henslin's book was $13.79. The Apple iBook's price for the same book was $9.99! Of course, I suppose I shouldn't have been quite so surprised. I guess I just wouldn't have thought I'd see nearly a $4 difference between the two stores. Thus, if you don't have any hard and fast objections against one store or the other, it will really pay to shop around when purchasing eBooks on your iPad. I've heard that Barnes & Noble is introducing a Nook app soon as well. I say bring 'em on! Competition can be a very good thing!